An Amiga hit that failed miserably on the PC, Amberstar is a novel top-down RPG that combines conventional RPG elements with adventure-game puzzles and ingenious riddles. 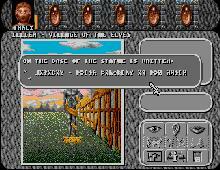 The hallmarks of Amberstar, other than its excellent interface and story, is the sheer *size* of the game. In this truly epic adventure, you will journey to far-flung corners of the realm in your quest for 13 pieces of the Amberstar that will yield access to the evil stronghold. With colorful graphics, tons of items and catacombs to explore, and colorful NPCs, Amberstar is a masterpiece. Too bad Thalion never released the PC version of the outstanding sequel, Ambermoon. Two thumbs up, way up!